You've put a lot of work into your front yard. The crowing touch will be to install some low voltage landscape lighting that will help your home feel inviting to guests who visit you after dark. Here's a few ideas to keep in mind as you prepare to install your lighting. Your first step will be to determine the mix of lights you will need to create the effect you want. Make a rough sketch of your yard, taking note of a couple of focal points you want to highlight. Consider how persons will get to the walkway and if lighting would be helpful. Once you know where you need the lighting, it is easy to determine what type and how many units you need. While laying out your lighting plan, keep in mind that you will need to place the transformer in a location that is unobtrusive, but still easy to access. Your low voltage landscape lighting will be powered by the transformer, and as such it is important that you be able to get to it without having to move, climb, or crawl your way to it. Once your lights are purchased, lay them out in their positions. This will give you the chance to determine how your main power cable will need to be placed in order to accommodate all the fixtures. You may find that some minor adjustments in position will be necessary. 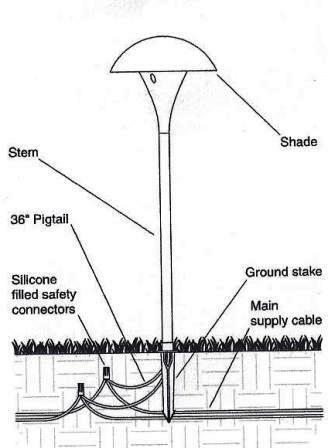 Don't start digging until you know exactly where your low voltage landscape lighting is to be placed. Simply lay out the cable so that it encompasses all your lighting locations. Next, attach the fixtures to the main cable. This is accomplished by cutting through the cable. Insert both ends into the fixture post and connect to the socket. Please note this is something that must be done correctly. If you have any doubts about your ability, call in an electrician. Once all lights in your low voltage landscape lighting plan are connected, flip on the juice and make sure there are no problems. If everything is working, you can now dig your trench and bury the cable. Make sure your fixtures themselves are standing at equal heights. Cover the cable with sod or mulch. Low voltage landscape lighting is relatively inexpensive and it adds a great deal of atmosphere to your home. With a little work, you can create an ambiance that you will enjoy for years.